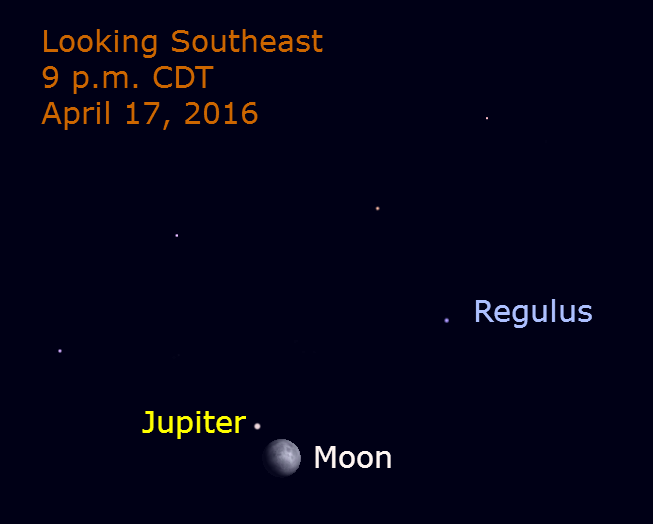 That bright star near the moon this evening is Jupiter. The accompanying chart shows the pair high in the southeastern sky tonight at 9 p.m. CDT. Jupiter and the moon are 2.5 degrees apart. The star Regulus is nearby. Jupiter and the moon appear together throughout the evening and night as our planet rotates, and they appear to move westward. In the Chicago area, the moon sets in the west at about 4:30 a.m. CDT. While Jupiter and the moon appear close together, Jupiter is nearly 1800 farther away than the moon, yet Regulus is over 3.5 million times more distant than Jupiter. Did you see Mercury this evening? For the next several evenings, look low in the west-northwest about an hour after sunset. Here’s our view from last night.